We are Adrienne and Paul McVerry - a creative and industrious couple from Tuchekoi Queensland. We are a keen gardening couple who love looking after our rural property, and we saw a need for cleaning up before heading back into the house after working in the garden or on the farm. 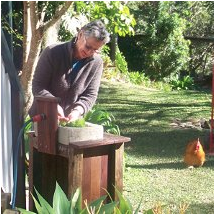 Adrienne is a keen craftsperson, and started experimenting with bird baths and bird feeders, to attract birds into the garden. She perfected the technique in the back shed at Tuchekoi, and decided to design a tub to wash up in after gardening. With a native timber plantation on the farm, Paul has always been interested in hand crafted timber products. He started with making kitchen blocks, walking sticks and coffee tables out of local timbers. With Adrienne working on a garden tub, he decided to craft the hardwood timber stand to support the basins, and hence the Tuchekoi Tub was created. Tubs: Individually handcrafted rustic bowls, in recycled hardwood or corrugated iron cladding on solid hardwood timber frame, or painted, treated plantation pine on hardwood frame. The bowls have added organic products in the mix, for a more individual look. The brass tap can connect straight to the garden hose, or can be plumbed into the mains water. Leadlight Posts: Outdoor garden art feature posts, individually crafted to your design. Glass panels - leadlight plus copper foil set into old hardwood rails and posts. Installed into garden with star picket.